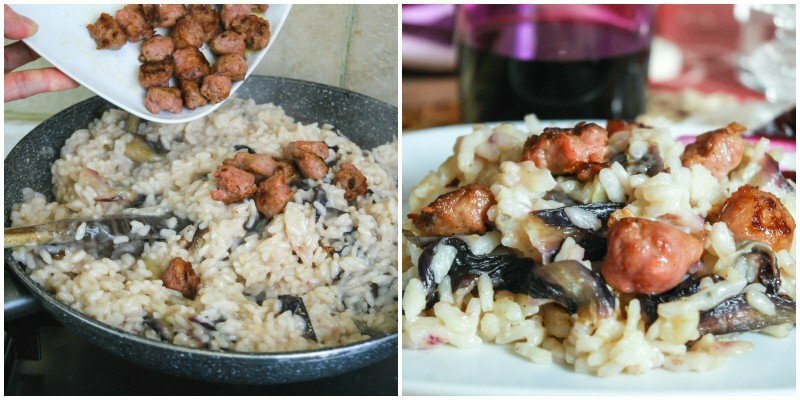 Risotto with Italian sausage is a grat combination! 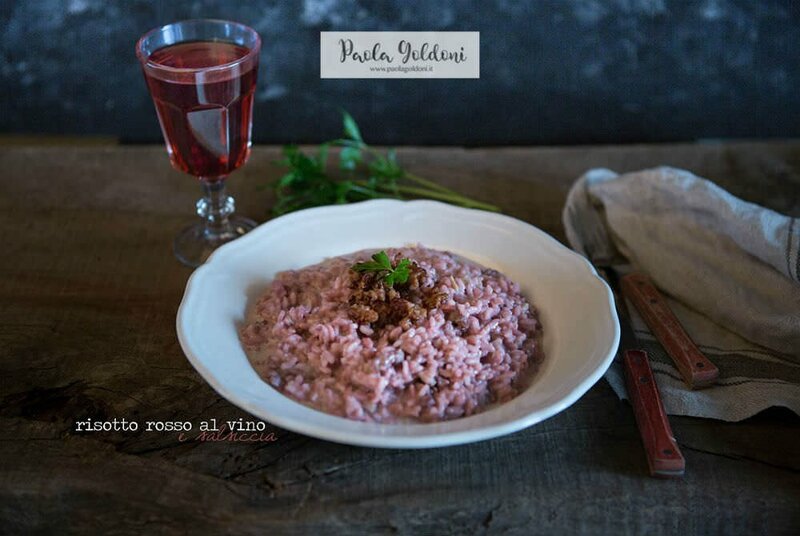 Italian Sausage Risotto with Treviso Radicchio is a winter dish in Italy, typical of the region of Veneto; risotto is served with mild Italian pork sausage and beautiful red treviso radicchio. 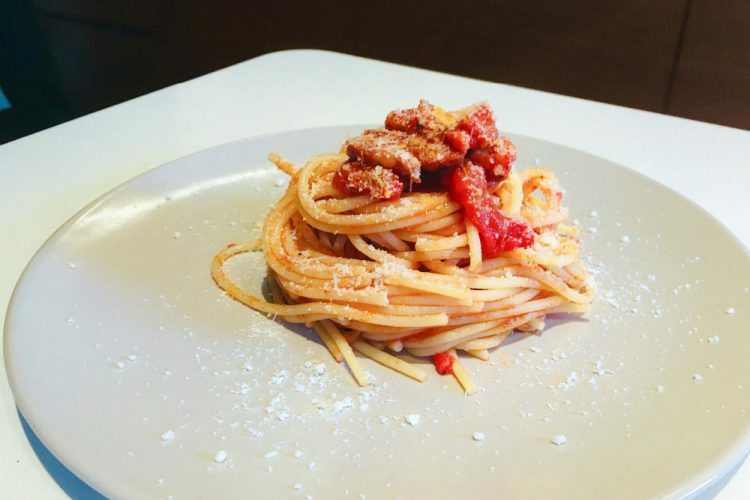 Finish it off with some fresh Parmigiano Reggiano and you’ve got an Italian recipe that will impress all your friends! Risotto is very popular in northern Italy. 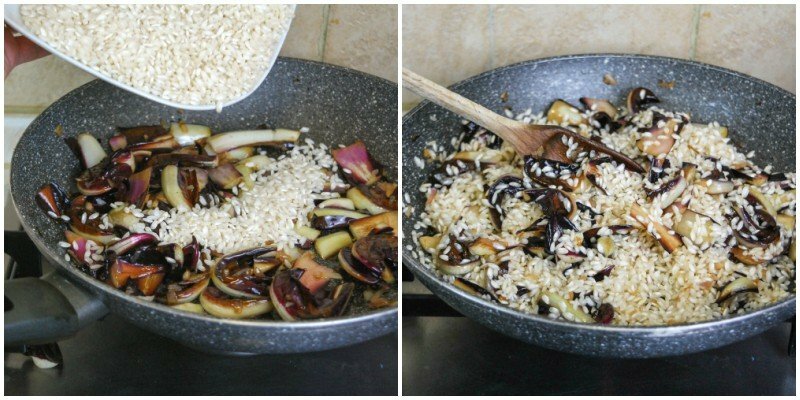 It’s a dish that you can make in many variations and with many different ingredients, even if Risotto cooking is not easy and requires some attention. But once you learn the method, you can prepare fabulous risotto recipes. Mind of using best variety of rice such as carnaroli rice because it has the ideal consistency for risotto. It’s the most used variety, even in haute cuisine, because it retains the taste of spices and ingredients in general and its beans keep perfectly the creaming at the end of the cooking. Treviso radicchio (radicchio rosso di Treviso or radicchio tardivo) is a more delicate type of radicchio with elongated red leaves that taste less bitter than the more familiar ball-shaped Radicchio rosso di Chioggia. It can be matched with any dish. 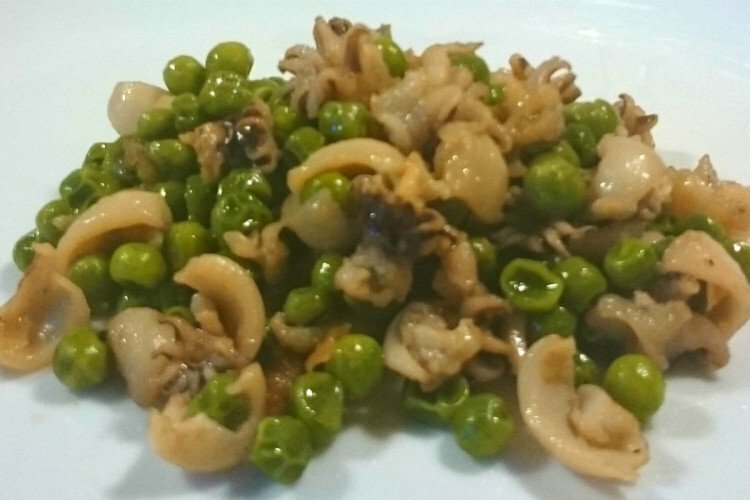 It’s good raw in a salad, grilled, excellent as a base for pasta dishes or for cream fillings for white meat, fried, grilled, stewed. And perfect for risotto recipes. 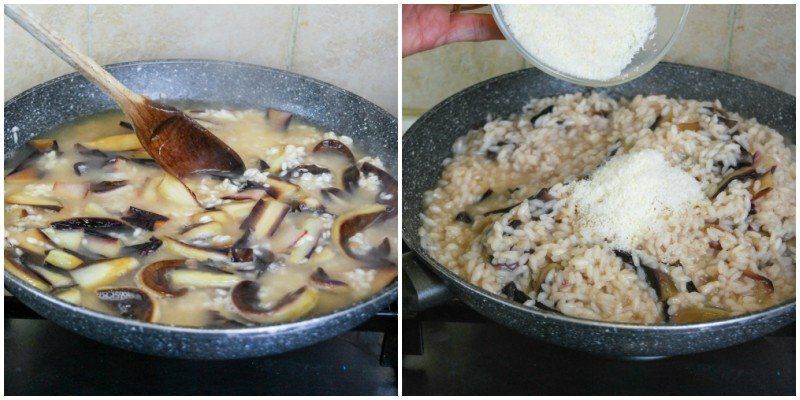 So here you go with a step by step recipe of Italian Sausage Risotto with Treviso Radicchio! 1) – First of all remove the sausage casings then cut it in small pieces. 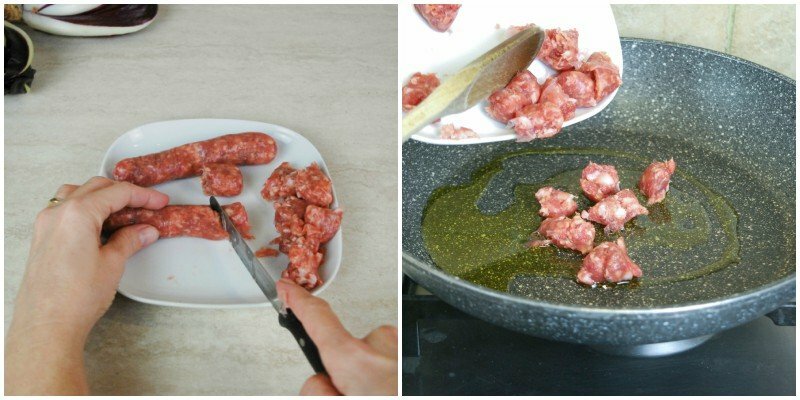 In a large pan, brown the sausage in 1 tablespoon of extra virgin olive oil. 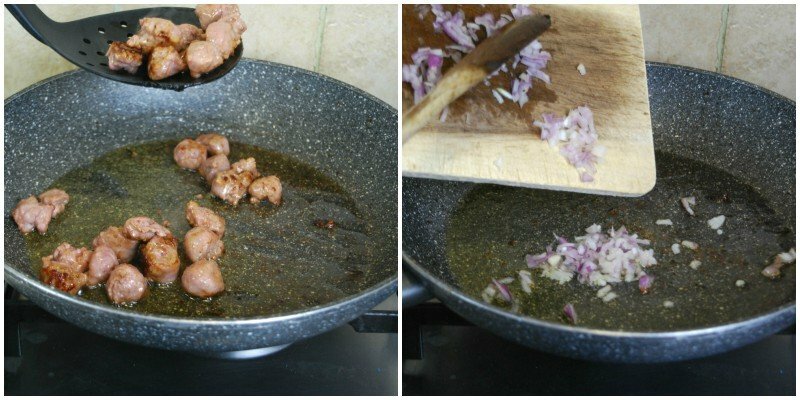 2) – Stir and cook all sides and when ready (about 3/4minutes) remove the sausage with a slotted spoon and put it aside in a plate. Now finely chop the onion and let it simmer in the EVO oil and the sausage fats for 1 minute. 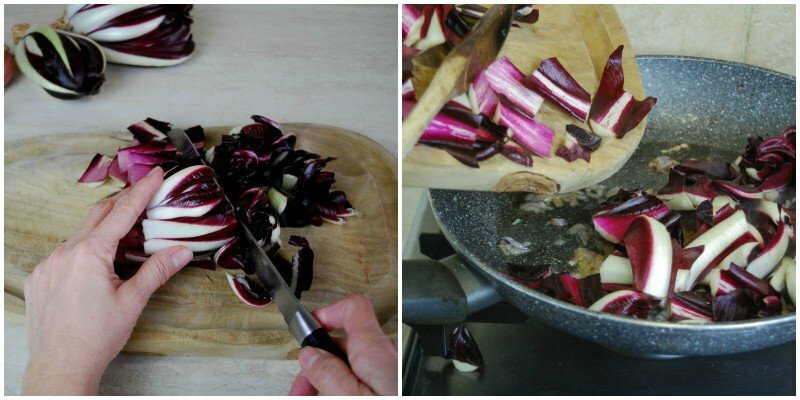 3) – Meanwhile cut treviso radicchio then add it to the onion soffritto and let it cook for 2 minutes, stirring frequently. 4) – Now add Carnaroli rice and let it toast for 2 minutes. Keep stirring. 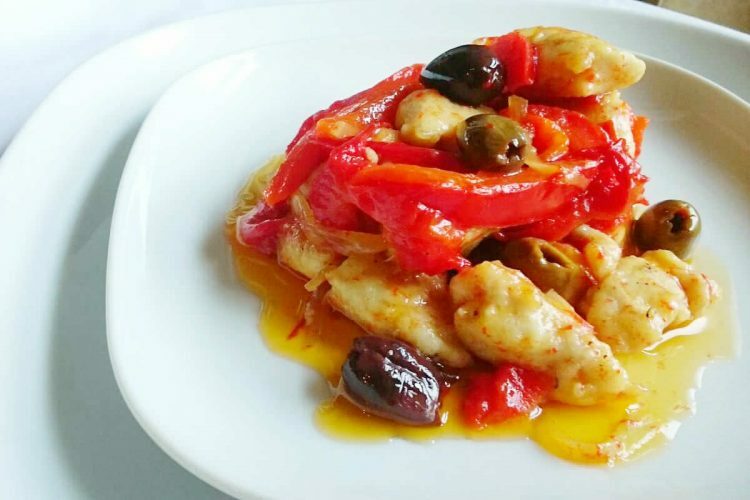 5) – Add the white wine and let cook on high heat till absorbed. Then add the 3 or 4 ladles of vegetable stock, until cover the rice. Cook for 15-18 minutes on medium heat, stirring occasionally and, if necessary, add a ladle or two of stock. 6) – Let absorb all the stock and add salt if necessary. 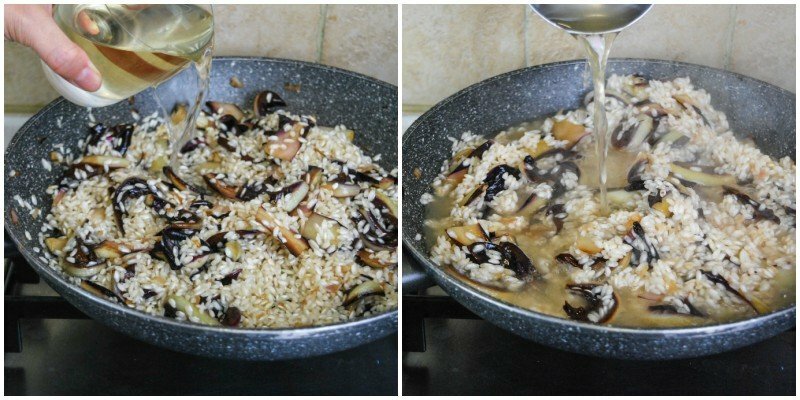 Don’t overcook the rice and the best way to not do it is to taste it frequently, so to be sure to add one more ladle of stock or not. When risotto is cooked al dente, turn off the heat then add grated parmigiano and butter. 7) – Stir and mix then add the sausage and stir again. 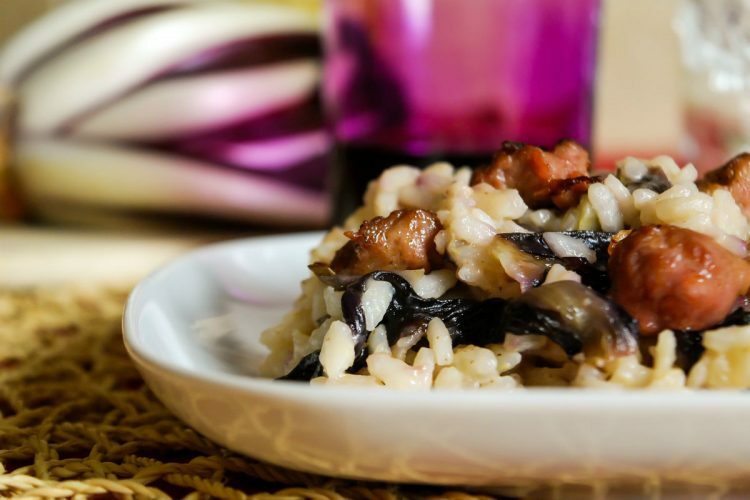 Serve Italian Sausage Risotto with Treviso Radicchio hot with the addition of grated parmigiano cheese according to taste. No Replies to "Italian Sausage Risotto with Treviso Radicchio"